One of the predictions from last week’s EVA on the economic concept that is suddenly dominating America’s financial discourse—Modern Monetary Theory or MMT—was that it would soon become front page news. This forecast became partially realized two days later when The New York Times ran an article titled “MMT Finds an Embrace in an Unexpected Place: Wall Street” on page one of its Sunday Business section. Those EVA readers who are predisposed to recoil at the thought that this grand theoretical solution could fix the planet’s economic woes are likely immediately alarmed by the article’s title. It touches on one of the more interesting aspects to this escalating debate, namely, how influential persons on both sides of the normal left/right continuum can be found in surprising positions. Among the money managers the article cites is the managing partner of Westwood Capital, Daniel Alpert. In his view, MMT “successfully debunks 40 years of misassumptions of how markets and public credit work.” Such words are clearly exquisite music to the ears of those who are at least mild MMT advocates. This is especially true for the socialist members of Congress such as Bernie Sanders and AOC (whose given name is Alexandria Ocasio-Cortez) since MMT offers a purportedly pain-free way to finance their social programs. To all but the most starry-eyed, these are almost certain to be enormously costly. As noted last week, one of the most articulate spokespersons for MMT is Professor Stephanie Kelton from Stony Brook University. Prof. Kelton was extensively quoted in the NY Times article, including this wonderfully calming view of America’s rapidly climbing sovereign indebtedness: “The national debt is nothing more than a historical record of all the dollars that were spent into the economy and not taxed back, and are currently being saved in the form of Treasury securities.” After listening to one of Prof. Kelton’s lectures on the topic, a key premise is that it’s wrong to worry about how to pay for new spending initiatives if they are perceived to be needed. To her, it’s far better to spend the money and then figure out how to finance the expenditures. Basically, it’s an inversion of a budgetary convention that has been in place for most of this country’s existence. In this second half of the Bubble 3.0 chapter on MMT, we’ll hear from a number of those who vehemently oppose this marvelous new economic theory. (In an EVA coming to your inbox soon, we’ll hear from Charles Gave that it is neither marvelous nor new, at least in his opinion.) But that’s why I wanted you to read the views from some credible folks, including on Wall Street, who believe MMT’s time to shine is nigh. Next week, you’ll receive one of the most persuasive arguments I’ve read in favor of the acrimonious acronym from someone I hold in high regard. As I think about it, perhaps Wall Street is a perfect venue to hash out this debate considering it is a constant battleground between bull and bear stories. You can rest assured this controversy will only intensify as we move into the election year of 2020. Somewhere in the voluminous documents I’ve been assembling on MMT in preparation for this chapter, I came across a line to the effect that Donald Trump is America’s first MMT president. To which I say, bingo! In fact, I’d add that all of the Fed’s quantitative easings (QEs) amounted to MMT with a fig leaf. The MMTers simply want to rip off the fig leaf and go au naturel. While it took Mr. Trump many months to figure out that the Fed’s reversal of QE—QT, or quantitative tightening—was a stealth form of rate increases, he belatedly got the message. He realized that with the Fed selling treasury bonds at the same time his “yuge” corporate tax cut and spending increases were causing the deficit to soar to levels unheard of outside of war or a deep recession, a colossal collision was looming. Whether it was due to Mr. Trump’s urgings or fears of a market panic (more likely the latter, in my view), the Fed has now announced it will stop QT at the end of September and I think it could be even sooner if economic data continues to atrophy. Thus, in effect, the Fed will leave trillions of dollars of government bonds and mortgages on its balance sheet, all purchased with fake money. While not directly financing Mr. Trump’s budgetary blow-out, it is enabling it nonetheless. As Gavekal’s Will Denyer also commented in his MMT piece, maybe one of the reasons for the convoluted process of QE (which most of the world’s leading central banks have also done) was so that the average citizen wouldn’t be able to figure out that de facto debt monetization was occurring. To quote another US president: “Mission accomplished”. 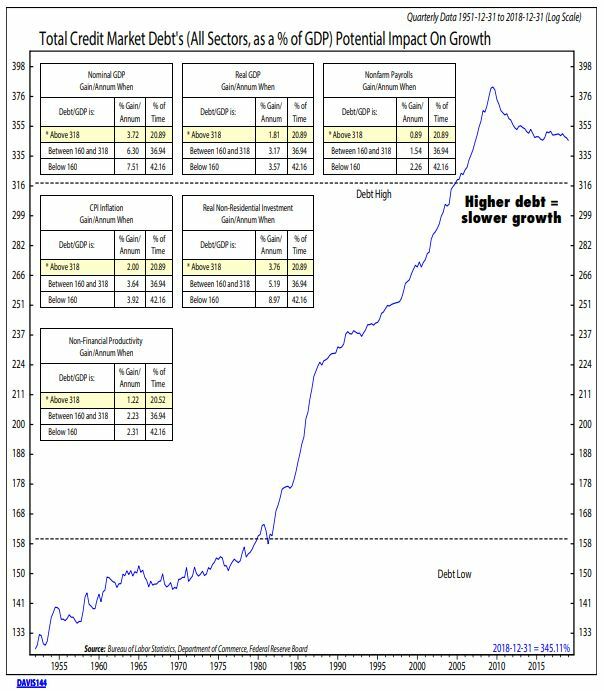 And maybe, to paraphrase the president most responsible for the inflationary 1970s, Richard Nixon, “We’re all MMTers now”—whether we realize it or not. Along similar lines, at the time I began to create my outline and assemble documents for this chapter of Bubble 3.0, my great friend Grant Williams stayed with my wife and me for several days. 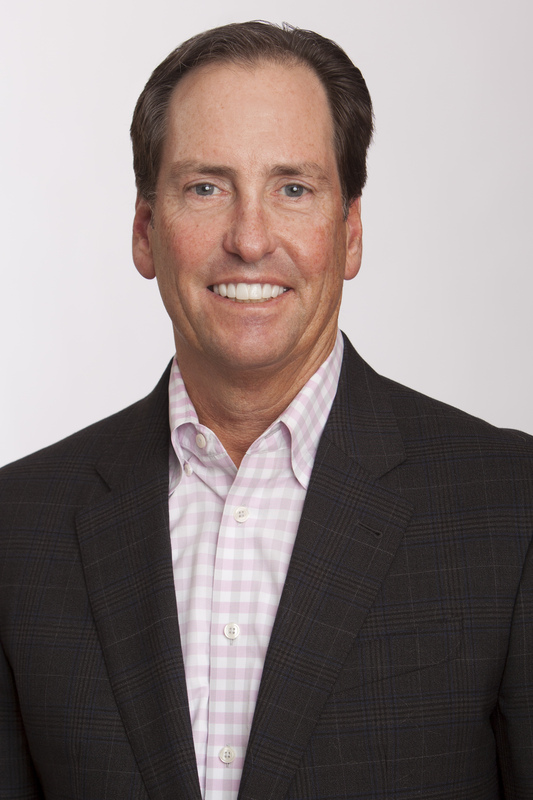 If you don’t know, Grant has become something of a phenom in the financial industry between delivering keynote speeches at the Mauldin Strategic Investment Conference, writing his popular weekly newsletter, and being a co-founder of Real Vision TV. If I am skeptical about the long-term efficacy of the central bank policies we’ve been living with for a decade, Grant makes me look like Dr. Pangloss wearing his famous rose-colored glasses. 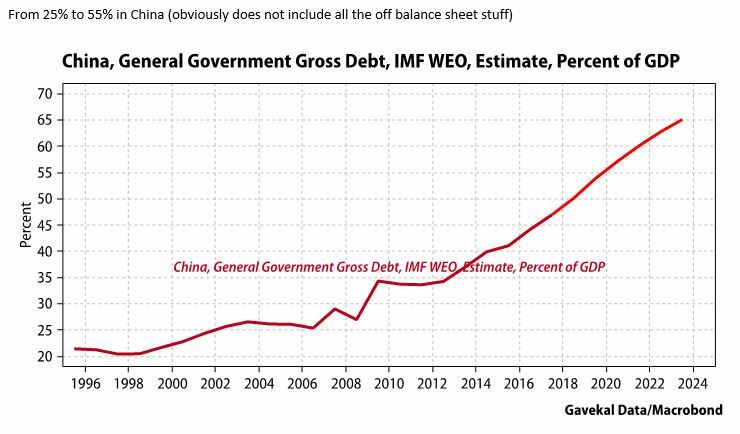 As far as the government debt eruption that has occurred goes, one of the most shocking aspects of MMT is that its devotees contend the developed world hasn’t done nearly enough deficit spending over the past decade. Their adamant view is that if countries like the US would only let the red ink really flow, our problems would be solved. 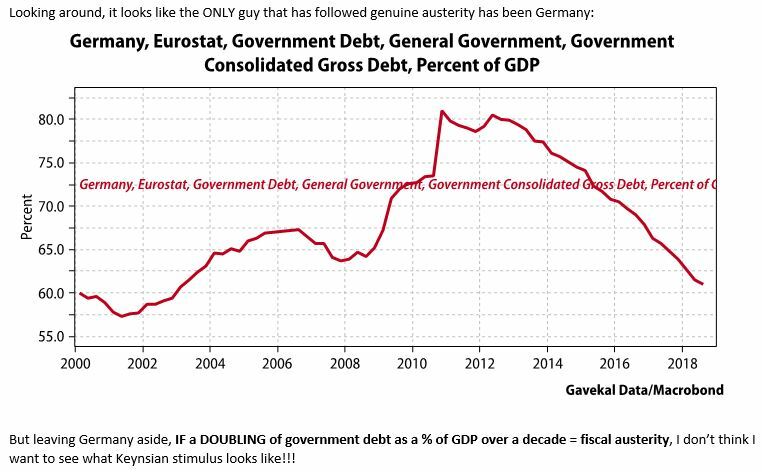 Many of them even assert that most rich countries have been engaged in fiscal austerity since the Great Recession—in other words, they’ve been too prudent with their finances. If this view triggers a gag reflex in you, I’m right there gagging, too--and for good reason. My partner Louis Gave recently produced these charts on the unparalleled--at least in peace-time--balance sheet degradation of most of the world’s mightiest nations (Germany being a notable exception). 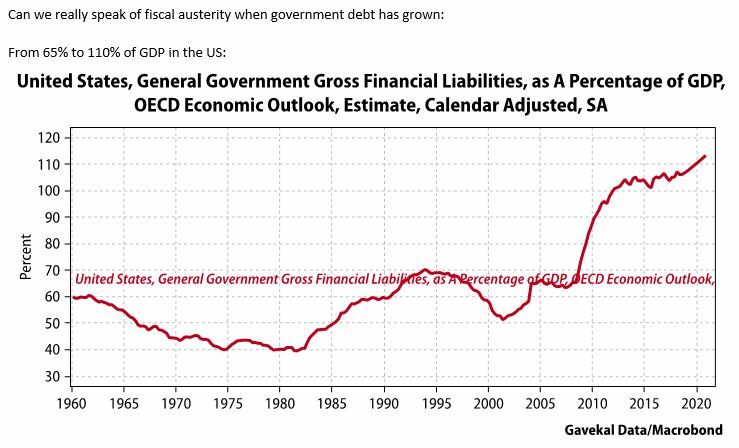 Further, please look closely at our own national debt progression. 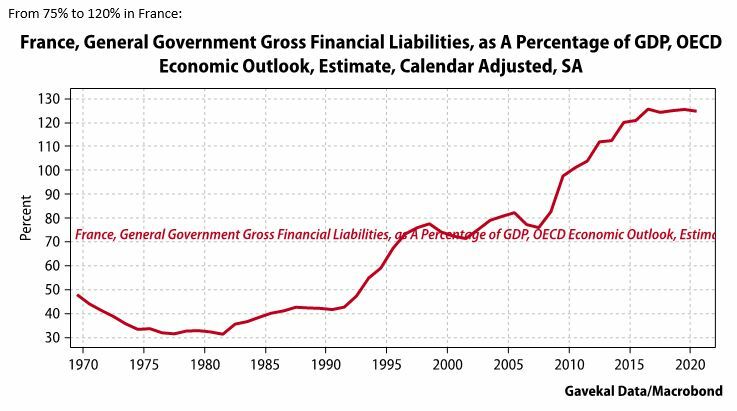 You’ll notice that during times such as the 1960s and 1990s--when debt was falling as a percentage of GDP (boy, those were the days!) 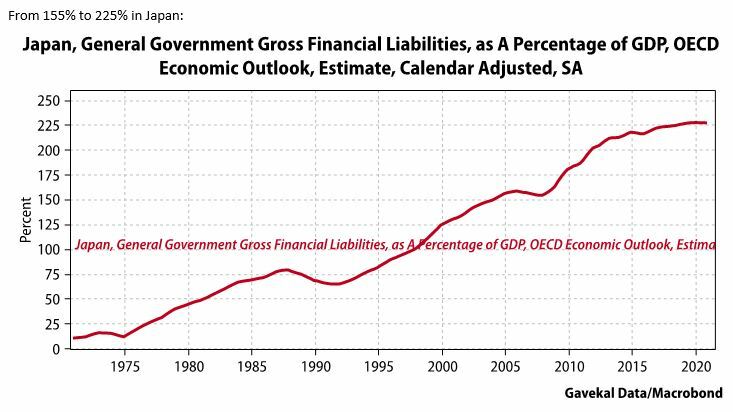 --growth was immensely stronger than it has been over the last twenty years when our government’s indebtedness has increased far faster than GDP. As Louis wryly wrote when he sent these to me, if this qualifies as fiscal austerity he definitely doesn’t want to see what Keynesian stimulus (or way beyond) looks like. 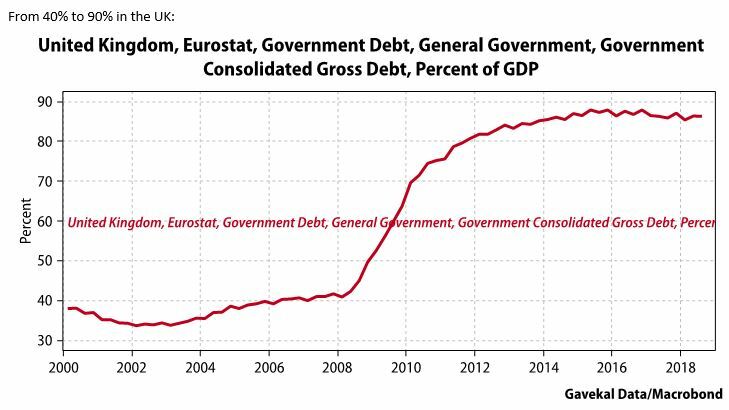 Similarly, the legendary Ned Davis, founder of the venerable research service that bears his name, recently ran this chart which should be pretty much proof-positive to all who aren’t totally brainwashed Keynesians, and now MMTers, that high levels of government debt retard, not enhance, growth. If this sounds to you like what Charles Gave has been writing in these pages for years, you get an “A” for attention. MMT pushers admit that there could be a limit to what they are proposing but it’s not a concession that excessive debt is, in and of itself, a bad thing. Instead, their belief is that a country issuing debt in its own currency, like the US, can go into deficit spending overdrive until—appropriate drum roll here—inflation becomes a problem. They reassuringly say that at this theoretical point their appointed puppets representatives will then slam on the brakes. Spending will be cut, taxes raised, and interest rates elevated enough to quash inflation. In my view, that’s like believing the tooth fairy, the Easter Bunny, and Santa Claus are more real than your next mortgage payment (or if you are among the “tippy-top” rich, your next estimated tax payment). 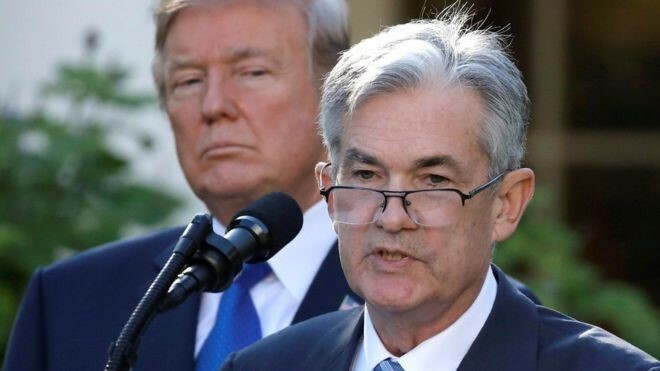 Jay Powell recently expressed his frustration that all of the Fed’s huffing and puffing up of asset prices has been so ineffective in raising inflation to 2%. The Fed is now openly discussing letting inflation run hot for a while. MMTers believe the Fed can’t do it on its own and they’re probably right. But MMT almost certainly will—and almost certainly way, way beyond 2%. Unsurprisingly, I agree with Grant. With debt levels immensely higher now than they were when Paul Volcker jacked the prime rate to 20%, about 8% above inflation, it’s almost unimaginable any Fed chairman would attempt such a drastic move. More probable, it will be a replay of the 1970s when the Fed was almost continually behind the inflation curve. So, what’s an investor to do right now? It’s becoming increasingly clear the Fed is done for this tightening cycle (any doubts should have been dispelled by Mr. Powell’s comments in late March, not to mention the Trump administration’s pressure for an immediate ½% cut). More pundits are realizing that the Fed likely overtightened, as incredible as that is at a mere 2 3/8% fed funds rate and 10-year treasury yield that topped out just over 3%. Yet it’s been our view in recent months that 3% on the 10-year T-note is the new 5%. Speaking of longer-term rates, they have been tumbling since last fall. Should recession concerns continue to mount, Powell and Co. are very likely to start cutting short-term rates before long. The problem is that cutting from a point that used to be trough levels, during pre-2008 recessions, leaves precious little room for rates to fall. Please realize that when the Fed began easing in 2007, as housing crashed, its key rate was over 5%. Almost exactly two years ago The NY Times ran an article by Justin Wolfers, Professor of Economics at the Univ of Michigan. It has turned out to be remarkably prescient about what’s unfolding currently (to access it click here). Well, we’re obviously a long way shy of 6%. This is why I believe something like MMT is coming…eventually and almost inevitably. But in the meantime, the world is grappling with inflation, economic activity, and interest rates all eroding. To adjust to that reality, Evergreen began extending maturities (aka, duration) with its client bond holdings when it became clear to us at the start of the year that the Fed was waving the white flag. However--and this is a big “however”--should it look like a blow-the-doors-off fiscal “solution” along the lines of MMT is becoming broadly embraced, it will be time to go very short-term with bonds and also unusually heavy in precious metals. MMT has all the markings of being a gold-bug’s dream come true—and a true nightmare for people living on fixed-incomes. MMT is such an important topic that it deserves a book, not merely a chapter. Some have done just that but they tend to be pro-MMTers wearing those previously mentioned rose-hued Panglossian spectacles (Professor Kelton has one due out next spring). More likely, in the opinion of this author, if it’s adopted, there will be many books written in the future about how it destroyed the US dollar and drove inflation to socially destabilizing levels. But because the rise of MMT is coinciding with America’s Leftward Lurch it is arriving at the perfect time to gain widespread acceptance. In a way, this is the culmination of the forces that have been building ever since governments and their central banks decided to go all-in on extreme stimulus--and then continued to wash, rinse, repeat, for an entire decade. To reprise my recurring question from “No Way Out”, what price prosperity? What have we really gained from this unprecedented reliance on never-ending monetary and fiscal amphetamines? One of the more fascinating footnotes about WWII was how Nazi Germany issued vast quantities of crystal meth to its troops. (Apparently, the German high command in WWII was just that; many senior Nazi officials and generals were reportedly junkies themselves, including der Furher.) Like John Law’s MMT in pre-revolution France, using meth worked great for a while. It fed the myth that Nazi soldiers were truly members of a master race as they seemed to be able to perform superhuman feats on the battle field. Of course, over time the synthetic high wore off. The after-effects were horrific. Once fully addicted, excessive sweating, dizziness, depression, and hallucinations often occurred. Some died of heart attacks under its influence while others shot themselves during psychotic episodes. Fortunately, like many of Hitler’s ploys and schemes, it failed in the end. Money isn’t meth, though some people seem just as addicted to the former as the latter. One could reasonably argue markets today are as hooked on the $13 trillion of fake money that has been injected by the planet’s fix-providers central banks as the Nazi soldiers were in WWII on crystal meth. This addiction has left entities like the Fed, the European Central Bank, and the Bank of Japan unable to withdraw the monetary uppers for fear of creating another event such as seen in last year’s fourth quarter. Yet, the stimulative effects are clearly wearing off. Combined with the growing realization that the eradication of interest rates is back-firing for a growing list of reasons, the powers-that-be, or want-to-be, are becoming increasingly desperate. Consequently—and with potentially profound consequences—the pressure is mounting for a solution set that is far more radical than what has been attempted over the last decade…as hard as that is to believe. While many disagree with me, as we will see in future EVAs, if Modern Monetary Theory--or a variation thereof--is actually implemented, America’s future is likely to be very hard indeed. If so, perhaps the financial theory pendulum will swing back toward another, more pleasant form of hard--as in money. When I read this paragraph, I was immediately taken back to the Book “Atlas Shrugged” by Ayn Rand. I can see the rich disappearing into a hidden part of the World far from the crumbling countries of the World who desperately pull at whatever paltry levers of power they have, trying desperately to wrestle some semblance of control and sense out of the disintegrating society that they created…which leaves me wondering what becomes of those who, through no fault of their own, cannot afford to join the exodus from this Stampede of Stupidity… Makes me want to buy a remote island!! !